this baby corn masala recipe is spiced with a tang coming from the tomatoes and a mild sweetness, creaminess coming from the cashews. 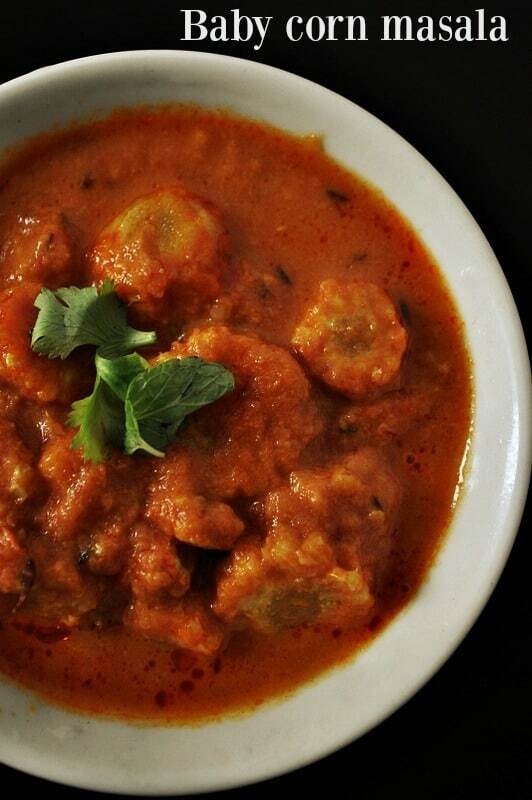 this is a tomato based gravy and tastes delicious with chapatis or even parathas. the recipe takes some time to make, as the corn are cooked in the gravy itself. to shorten the time, you can parboil or fry the corn and then add. you can also make the curry in a pressure cooker. Yup!!! am back after a long break, so many excuses on my side, parents around, down with flu, aishu’s HOLIDAYS etc… anyways am again blogging:) Okay!!! 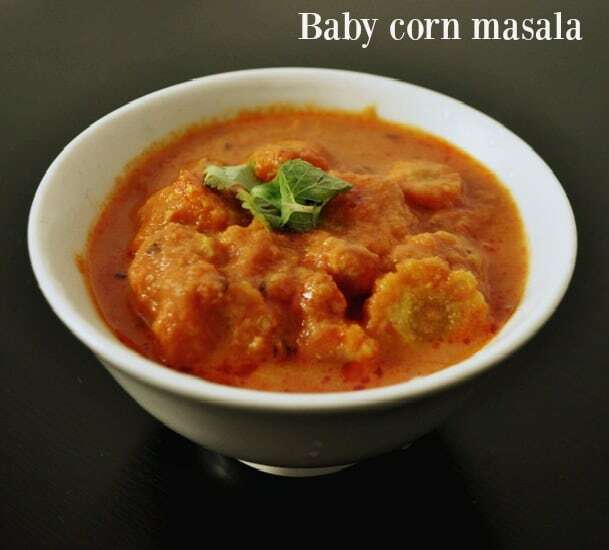 coming to our today recipe is baby corn masala, a friend was asking me this recipe for long. I made it while she visited here. Cut the baby corn into small pieces and make it ready. MeanWhile blanch the tomatoes and cashews for about 10 mins and then grind it as a smooth paste keep aside. Now heat the pan or a pressure cooker add oil and cumin seeds. Now add the grind tomato puree, chilly powder, turmeric powder and salt, saute for a while. Now add the chopped baby corn and mix well with the masala. Finally , add the grinded cashew paste and mix well. You can cook for 15 mins or can pressure cook for 3 whistles. Once the baby cooked well, serve it with rotis or any rice. Baby corn masala with no onion no garlic which is goes well with roti. Cut the baby corn into small pieces and make it ready. Mean while blanch the tomatoes and cashews for about 10 mins and then grind it as a smooth paste keep aside. Now heat the pan or a pressure cooker add oil and cumin seeds. Now add the grinded tomato puree,chilly powder,turmeric powder and salt,saute for a while. Now add the chopped baby corn and mix well with the masala. Finally add the grinded cashew paste and mix well. You can cook for 15 mins or can pressure cook for 3 whistles. Once the baby cooked well,serve it with rotis or any rice. Thank you for a recipe .sabji bhot Sachi Bani mere mother & father in-law ko bahot pasand aayi once again thank you mam. amazing , lovely recipe with out onion and garlic ! thanks for sharing !